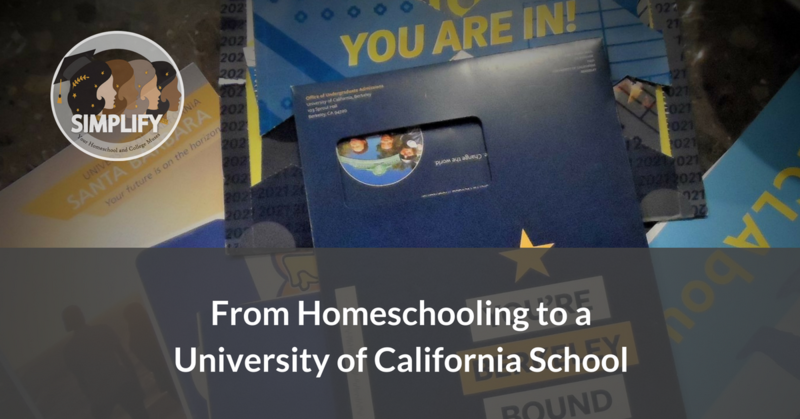 For years in the homeschool community, we have heard how difficult it is for a California homeschooler to gain admittance to a UC school. With the a-g requirements that the UC schools used and a limited number of approved providers of a-g classes, the path seemed impossible. Over the years though more and more homeschoolers are getting into UC schools which is definitely wonderful news for both the schools and for homeschoolers! The reasons for more homeschoolers getting into different UC schools seems to be a combination of things. First, it seems that the UC schools are becoming more and more open to homeschoolers perhaps as a consequence of the high number of homeschoolers in California. Second, with online educational providers and the use of community colleges, there are more opportunities for California homeschoolers to meet the a-g requirements. Lastly, there is more than one path to gain admittance to a UC school making it easier for homeschoolers to meet the requirements in a variety of ways. Remember, these are minimum requirements, which means that fulfilling them as stated does not guarantee admittance to any of the UC campuses. California high schools seek a-g approval from UCs by submitting their courses for an audit process. This is where as homeschoolers, we find our hands tied. There is nowhere for us to submit our home-made classes to UC for approval! Community college (CC) coursework: usually starting in 10th or 11th grade, homeschoolers are able to access a-g compliant coursework to fulfill requirements. These classes are especially helpful in the lab sciences, higher math classes, and for foreign language requirements, the three areas that are often the most challenging for homeschooling parents to teach. To search for a-g approved CC coursework, utilize the UC A-G Course List site. Plug in the CC’s name in the Institution Name search bar to see a drop down list of a-g approved classes by year and subject category. Homeschooling through the Private School Affidavit using a-g approved vendors: Families may choose to use this path with or without CC coursework. Many enterprising homeschool course providers have submitted their classes to UC for a-g approval and year by year, the list seems to be growing, giving us so much more choice than what we had before! To find these classes, use the UC A-G Course List site by typing the vendor’s name in the search bar. Charter school or public school independent study enrollment: Many homeschooling families choose to enroll in independent study and high school programs offered by various state-funded charter school programs. Since the schools are publicly-funded and issue the final high school transcript, students are required to follow a state-mandated, four-year high school program with less flexibility to choose their classes. Some charters allow students to take a non-college-prep pathway that does not stress on fulfilling a-g requirements. We recommend checking with the relevant schools to see what options are available to your child. Admission by exam refers to taking the SAT or ACT with Writing test and two SAT Subject Tests of your choice. The scores from these tests will then be used to determine if the student has earned a minimum UC Score total for admission. To learn more about this path and to see how you calculate the UC Score please see this page. If the student has taken a transferable college course and has received a grade C or higher, there is a risk that UC will not consider a Subject Test in the same subject area as one of the two Subject Test scores for admission by exam. For example, if a student has taken algebra-based physics through the community college and received a grade of A, B or C, UC might not use the student’s SAT Physics score as a qualifying score for admission by exam. We strongly recommend speaking with a UC admissions counselor before your student takes Subject Tests with the view of applying for admission by exam. Admission by exam is a great choice for families who have students who are strong test takers. Depending on their goals, admission by exam allows students more flexibility to either put aside or supplement the required a-g coursework, and to continue on in high school with individually planned classes. Students who have not met the admission requirements through a-g or testing might still be accepted to a UC school via admission by exception. This path is usually reserved for students who do not have transcripts, who have not had the same opportunities as other students, or who have had to overcome highly unusual and/ or very difficult circumstances. If using this path to apply, you will need to utilize the personal insight questions to present your unique life story. You may also want to use the additional comment section on the application to better explain yourself as a candidate. Certain UC campuses may be more open to this option than others and again, we recommend contacting the schools directly if planning to explore this application path. Still confused or worried about applying as a homeschooler to a UC school? We have two suggestions. Complete a pretend application and apply to more than one UC school. In your student’s freshman or sophomore year, when the UC application becomes available in August, register for a UC application account and (with your student if they are interested) take a test drive of the application to see how best to complete it. This, in turn, will provide valuable insight into how best to plan your student’s upcoming high school years. Repeat the test drive the following year to give more certainty. By the time your student is ready to apply to a UC school in senior year, they will feel so much more confident about the UC application process as so much of the application will look and feel familiar to them. The UC application makes choosing schools easy with one check box per school. Too many times, families target only selective UCs without realizing that another UC school might be a better fit for the student. To give your child the best chance of being accepted to a UC, research as many of the schools as you can and be practical about which of these schools are reaches and which ones matches or safeties. Then, apply to at least three or four UC schools. It only takes one application and one round of writing personal insight questions so why waste the opportunity? Jill and Suji are both well-versed with the UC application process, so do reach out to us if you have more questions. Next StoryCollege Was So Much Cheaper in My Day!